With huge recent shifts in the way enterprises are built, marketed, and monetized, these are "wild west" times for business. In this new landscape, entrepreneurs and small business owners actually have an edge in marketing without spinning their wheels or going broke. 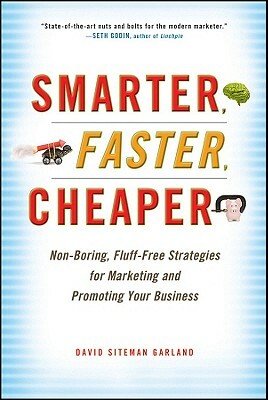 Smarter, Faster, Cheaper gives you an innovative, approachable new guide on how to market, promote and improve your business drawing on real world examples and offering practical advice as opposed to fluffy theory. It presents a complete roadmap for marketing and promoting your business with the latest techniques. From learning when to skimp and when to splurge to mastering the art of online schmoozing, Smarter, Faster, Cheaper will save you time, money, and aggravation whether you're building your tenth business or your first. David Siteman Garland is founder of The Rise to the Top, The #1 Non-Boring Resource For Building Your Business Smarter, Faster, Cheaper. He writes and hosts a network of shows including RISE, a web show for entrepreneurs, as well as The Rise To The Top TV show on ABC (St. Louis affiliate). David is also a professional speaker (recently selected by Speaker magazine as one of the Hot Speakers of the Year). He has been featured on CNN, ABC, NBC, and CBS, and is a regular contributor and columnist for a variety of sources including Small Business Trends.